That's what the electoral college will look like on the night of November 6th. Barack Obama will be re-elected President of the United States by this margin, 44 electoral votes. That's only if the President carries Florida. Without Florida, Obama loses 262 -276. With 271 electoral votes needed to win, Mitt Romney becomes the 45th President with the slimist of margins. Add up all the states that are likely to go for each candidate. Then add in the states that are leaning to either Obama or Romney. You're left with only a handfull of states which in some combination will decided the election. If you concede Ohio to Romney, then Obama needs Florida to win. But without Florida, Romney cannot win. If you're Romney, you're doing the math so you can change the outcome. The President is stuck with his running mate. Joe Biden is the Vice President and would like to keep his job. Barring some drastic turn in the polls, Obama keeps him on the ticket. But Romney has yet to select his running mate. His choice should help him nail down the electoral votes he needs. Speculation is that Romney will choose Rob Portman, Senator from Ohio in order to swing that state and its electoral votes. Problem is, that is not enough. Romney still needs Florida to win. That's why he was considering Marco Rubio, Senator from that state. But Rubio is not the man for the job. Rubio puts Ohio and its 18 electoral votes back in play. The only person Romney can choose as running mate that gives him Florida and keeps him Ohio is Jeb Bush, former Governor of Florida. Watch for the machinations these coming weeks. 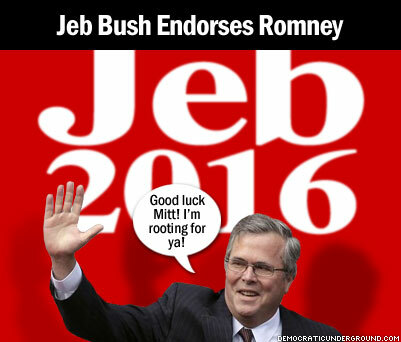 Romney needs Jeb Bush to win. Jeb Bush would rather sit out the election and run on his own 4 years from now. Romney goes to the elder Bush before the convention and pleads for the good of the party to put a Bush back on the ticket. Only one thing is for certain; Florida will determine the outcome of rhe election for President, again.